How Much Would You Have to Run to Lose Ten Pounds in a Month? Slapping on a comfortable pair of running shoes and hitting the trail or treadmill can certainly help you lose weight, which is one reason so many people do it. To achieve 10-pounds of weight loss over the course of a month, it takes the right plan of action that includes exercise and cutting calories in the kitchen. There are two ways to approach this goal: High-intensity and short duration, or moderate-intensity and longer duration. Both methods can help you lose weight; you just need to find the one that works best for you. Burning 10-lbs. of body fat in a month by running alone means you'd have to burn a total of 35,000 calories per month. That works out to more than 1,000 calories per day you'd have to burn. For a 160-lb. person, that works out to running at a brisk 8 mph for a 70 minutes per day, or running at 12 mph -- nearly a dead sprint for most people -- for about 45 minutes per day. This is probably not a feasible, long-term weight loss strategy. However, cutting calories from your diet along with running each day can help you reach the 10-lb. per month goal without having to run such a vigorous training schedule. Running at a moderate pace over a long duration – similar to running a marathon – burns a significant number of calories. A 160-pound individual burns about 600 calories per hour running at a moderate pace of 5 mph. Step up to a more brisk 8 mph pace and burn about 860 calories during a 60-minute workout. If you can manage to burn an average of 700 calories per workout five times per week, you'd burn the equivalent of one-pound each week. Cutting down your calorie intake by about 650 calories per day can make up the difference necessary to reach 10-pounds of weight loss by the end of the month. Increasing the intensity level when you run can burn more calories and promote more fat loss. Intense running, such as sprints or high-intensity interval training, produces what's referred to as excess post-exercise oxygen consumption, or EPOC. This is an after-burn effect that causes your body to burn calories after the workout is over – up to 95 percent of the total calories to be exact . This makes high-intensity running workouts a powerful fat-burning tool. Due to the vigorous nature of this workout, keep each exercise session at around 30 minutes or less and rest a day between workouts. Four of these workouts per week could potentially help you lose 10-pounds by the end of the month, but it's very difficult to forecast the results of such a workout. Everyone's body reacts differently, and vigorous exercise may not be right for you. Talk to your doctor before running sprints or high-intensity interval training. You know your body better than anyone, so listen to your body when you feel lightheaded, nauseous, excessively sore, or have sore joints. These are signs you need to reduce the intensity or duration of your workouts. While four 30-minute sprint-style workouts per week may be enough to reach the 10-pound-per-month goal, it's a workout strategy best used by experienced runners. 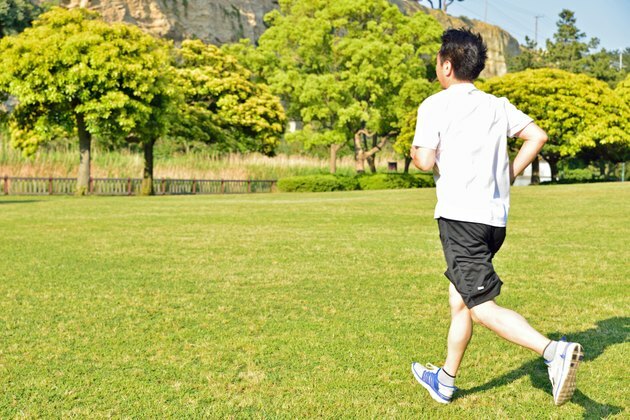 The best bet for you is to find a happy medium between moderate-pace running and vigorous sprints that challenges you yet doesn't cause your body discomfort. Remember, cutting empty calories is an integral part of the equation, no matter which workout regimen you choose. Eliminate empty calories, such as soda and sugary snacks, from your diet to achieve the calorie deficit necessary to reach the 10-pound goal. The human body adapts to the same workout routine day after day. It's important to vary your running workouts each week. For instance, run five times for 60 minutes at a jogging pace one week, and do four 30-minute sprint workouts the following week. Other variations include running hills, increasing workout duration, increasing intensity or running outside vs. on the treadmill. Changing up your running routine will help you avoid fitness plateaus, which can stop your weight loss progress in its tracks. Lastly, put more focus into how you look in the mirror opposed to what the bathroom scale is showing month after month. Your body's weight can fluctuate several pounds each day, so it's not the most accurate tracking tool. If your jeans are fitting looser, you know you're making great progress. How Many Treadmill Workout Minutes to Burn 3,500 Daily Calories? How Much Weight Can You Lose Running 10 Miles Per Week?